This cartoon about Keynesian economics sort of makes the same point, but not with the same eloquence. I don’t think it’s a case of media bias or inaccuracy, as we saw with the AP story on poverty, the Brian Ross Tea Party slur, or the Reuters report on job creation and so-called stimulus. But it does blindly assume that it is productive to impose more laws. Was it productive to enact Obamacare? What about the faux stimulus? Or the Dodd-Frank bailout bill? 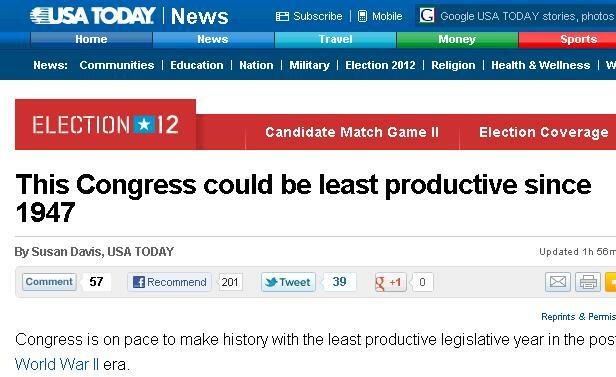 Wouldn’t the headline be more accurate if it read, “This Congress could be least destructive since 1947”? Here are the relevant parts of the USA Today report. Congress is on pace to make history with the least productive legislative year in the post World War II era. Just 61 bills have become law to date in 2012 out of 3,914 bills that have been introduced by lawmakers, or less than 2% of all proposed laws, according to a USA TODAY analysis of records since 1947 kept by the U.S. House Clerk’s office. In 2011, after Republicans took control of the U.S. House, Congress passed just 90 bills into law. The only other year in which Congress failed to pass at least 125 laws was 1995. …When Democrats controlled both chambers during the 111th Congress, 258 laws were enacted in 2010 and 125 in 2009, including President Obama’s health care law. To be sure, not all legislation is bad. Now that the Supreme Court has failed in its job, Congress would have to enact a law to repeal Obamacare. Laws also would need to be changed to reform entitlements, or adopt a flat tax. And some laws are benign, such as the enactment of Dairy Goat Awareness Week or naming a federal courthouse. But I’m guessing that the vast majority of substantive laws are bad for freedom and result in less prosperity. So let’s cross our fingers that future Congresses are even less productive (and therefore less destructive) than the current one. Dan you make some great points but the huge mistake was the Republicans being cowards on the debt ceiling. Now if they have failed to pass that then they would have shut down all the spending and that is the kind of gridlock that could keep most of the money in private hands where real jobs are created. Thanks for another interesting article that made me think. You are the best and I post your articles about 7 days a week since they remind me so much of what Milton Friedman used to say!!!!! Don’t forget that the House is in control of ALL of the apeinding that is done by the federal govenment. If they don’t acquisition it, then it is not spent and the government shuts down. They could tomorrow, apportion money specifically for every thing that the federal government is now doing and specifically EXCLUDE almost all of Obamacare. 85% of Obamacare would wither on the vine and disappear. Those folks ain’t gonna work for free. When the House claims to be powerless in the face of the Reid Senate, it is BS. They are set up to control ALL of the money and where it goes. Number of laws is only part of the equation. The potency of laws can vary by orders of magnitude. ObamaCare alone is probably equivalent to two three thousand laws in magnitude and in terms of cementing America’s irreversible trajectory towards Europeanization and decline. Actually not even European health systems are as redistributive as ObamaCare, its taxes and subsidies are. European systems are essentially a fixed (or at most flat) per capita tax to force participation into healthcare provided by a near state monopoly. By contrast, ObamaCare, while not a complete subsidy, is highly redistributive. In ObamCare, only the productive pay to insulate the less productive from the consequences of mediocrity. That is a very strong incentive for the productive to join the more leisurely life of the less productive, especially at the margins. With America leapfrogging even Europe in certain areas towards decline, American competitiveness is running out of compensatory measures and is thus close, or past the point of parity with the rest of the world. There is no return from this point, Paul Ryan or no Paul Ryan. Concisely stated, the slope of decline is steeper than any changes the electorate is willing to support not to mention that, predictably, the electorate responds to the decline and stress caused by hope and change by asking for more redistribution and more collective control of the economy, i.e. more HopNChange. The electorate is responding to the decline through the delusional and suicidal comfort of running downhill. In practical terms, learn how to be more French, ie. how to derive maximum personal satisfaction and fulfillment in a declining country, or at least as much as that is possible under conditions of deteriorating prosperity. There is still some momentum and there is still some productivity left to loot, mostly amongst the very group of Silicon Valley intellectuals who will keep going to work hoping that the more they work to insulate other people from the consequences of mediocrity the more motivated workers will become at both the high and low end of the productivity spectrum. It is a delusional hope but virtually every democracy has fallen for this fallacy. It is finally America’s time. It is a pity, and perhaps a coincidence, that it will be the first American black president the one who ushers Americans in this well-oiled self-destructive and delusional shortcut to prosperity. Betting that Americans will somehow respond differently to flatter effort-reward curves and somehow believe that “in America it will be different” is a foolishly risky bet, to say the least. If you have any brains, take mitigatory actions before America gets too deep into the irreversible decline process. Three billion people in the emerging world have awakened to the very individual freedoms pioneered by Americans. That would have posed a great challenge under any circumstances. A class-warfare flatter effort-reward curve America will lose its exceptional prosperity in short order. Productive is a nice euphamism that equates volume of output with accomplishment, which was the basis for much of the current legaleze that is generated in the lawyer profession, stemming from an age where they were paid by the word. Passing bills says nothing about the usefulness or effectiveness of those bills. Most of the over 200,000 pages of laws that Congress has enacted do not protect our freedom or liberty, and much of that is not constitutional under the 17 duties and responsibilities mandated that the federal goevernment takje care of.